Brownies, Cookies and Caramel are three of our favourite treats. 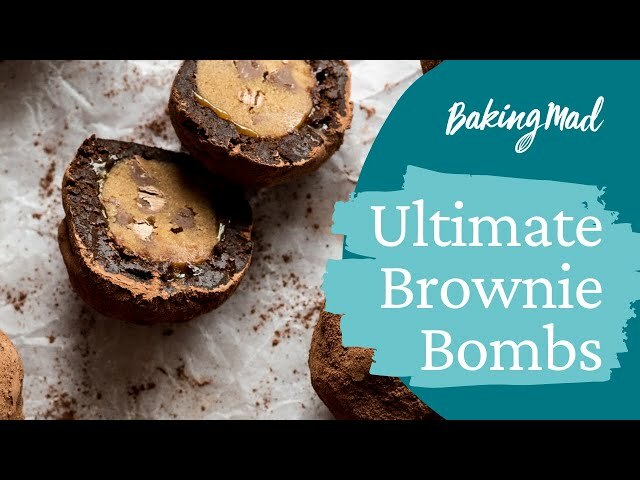 So we decided to create the ultimate indulgent bake by combining all three into a brownie bomb. A yummy cookie dough centre, covered in sweet rich salted caramel and wrapped in a delicious brownie layer makes up this pud. Each layer uses the finest Billington's Unrefined Sugar to give it a deep rich caramel flavour and makes this treat really moreish. First make the cookie dough. Cream together the butter and light muscovado sugar, add in the vanilla and salt and then the flour. Add the milk and mix well until you have a soft dough. Finally fold in the chocolate chips. Turn out onto a sheet of cling film and wrap well. Chill in the fridge for at least 30 minutes to allow it to firm up. This will make the dough easier to handle. Next make the brownie. Preheat the oven to 190°C/fan 170°/gas 5. Line a square 20cm tin with baking parchment. Measure the width and length of the tin and add the measurements together. Cut a strip of baking parchment slightly longer than the total measurement of the tin and a few inches higher. Fold it back about 1 inch along its length, then snip it at an angle at intervals up to the fold, making a fringe effect. To attach the baking paper around the side of the tin press the paper and it will stick to the butter/oil, the snipped edge should overlap on the base of the tin. To cut the rectangle base out use the tin as a template, drawing round the base with a pencil. Cut this out to fit over the snipped paper over the base. Melt the chocolate and the butter together in a bowl over a pan of simmering water. In another bowl whisk the eggs until pale and fluffy, then whisk in the dark muscovado sugar until there are no lumps. Allow the chocolate mixture to cool a little and then add this to the sugar and eggs. Mix well. Finally fold in the flour until you have a smooth batter. Pour the brownie batter into your prepared tin and bake in your preheated oven for 30-35 minutes. Remove from the oven and allow to cool completely in the tin. If you can, leave the brownie to firm up overnight. It must becompletely cold before it can be used in the recipe. To make the caramel, place all the ingredients in a medium saucepan and heat over a low to medium heat. Stir constantly until the ingredients have melted together and there are no lumps. Pour the caramel into a separate bowl and allow to cool completely. The caramel will thicken on cooling and is best left in the fridge overnight. When you are ready to construct the brownie bombs, line a baking sheet with parchment and place in the freezer. Roll your cookie dough into 20 equal sized balls about the size of a walnut (about 25g) and place on the parchment. Put the tray in the freezer to allow the balls to firm up. Remove the cooled brownie from its tin and mash up in a bowl or with a stand mixer using the beating tool. Mash and stir until the brownie disintegrates to the consistency of a soft dough. On a plate or board measure out 20 equal portions of this mixture and lay them out. They should weigh roughly 50g each. Set aside or even better chill while you make the next stage. Soften the caramel by giving it a good stir. You may need to warm it gently. It needs to be pourable with the consistency of golden syrup. Remove the cookie dough balls from the freezer. Carefully dip and coat each one in the caramel and place back onto the parchment. Put the caramel coated dough balls back into the freezer to firm up for at least 30 minutes. The next stage is quite messy but simple. To coat the caramel dough balls in brownie, line another tray with baking parchment. One by one take a 50g portion of your brownie mixture, roll into a ball and flatten into a disc in the palm of your hand. Place a caramel coated cookie dough ball into the centre and wrap the brownie around the ball. Roll around in your palm gently to seal and make a smooth ball shape about the size of a snooker ball. Do this with all of the balls, transferring them to the clean parchment as you do. Place back into the freezer for 30 minutes or in the fridge for a couple of hours or overnight. When the brownie bombs are chilled roll them in cocoa and then in your hands to make a truffle style appearance. This is a messy job and worth using disposable gloves as they heat of your hands will speed up melting. Store the brownie bombs in the fridge on baking parchment until ready to eat.